Located in the Stone Oak area of San Antonio, TX, Everyone’s ENT & Sinus Center provides pediatric and adult treatment to those suffering from sinus discomfort. The primary purpose of our sinuses is to produce mucous that is taken into the back of our throats with any dust, pollens, bacteria or viruses that have been filtered. When there is a disturbance to this process, sinus infections, sinus headaches, facial pain, nasal congestion and more occur. C. Dr. Gilliam can see the structure/anatomy of the sinuses along with possible mucosa or fungal issues. Chronic and recurrent sinus infections can cause severe facial pressure, congestion and drainage, as well as headaches and exhaustion. The negative affects of this could be costly if required to miss school or work for multiple doctors’ appointments. Sinus infections are a result of bacteria growing in the sinuses. All of us have bacteria and fungus in our nose; however, the number of sinus infections we get determines the way our body filters and removes them. Allergies, irritants, a poor immune system and abnormal anatomy are all contributing factors to sinus infections. A combination of these things is what brings you to us. The occasional sinus infection is normal, but when you suffer throughout the year or get an infection consistently is when it is time to make an appointment. Medical management can consist of three weeks of antibiotics, nasal saline flushes, steroids, nasal steroids, and/or antihistamines used to treat sinus infections. Simply because you have a sinus disease does not mean you have allergies. Also, if you have allergies and are going through treatment and continue to show symptoms, you may have a sinus disease that needs to be taken care of. Dr. Gilliam will look at these factors to determine the full scope of your situation. The sinuses are still present after surgery unlike many operations that remove a structure. Some diseases are very persistent and may require more than one surgery. For the majority, the need for additional surgery is due to lack of medical management after surgery. This is extremely vital to the success of treating sinusitis. Here at Everyone’s ENT & Sinus Center we are here to help before, during, and after surgery. Anti-fungal treatments may be necessary and patients with polyps have overactive mucosa, which will need maintenance therapy to prevent recurrence. Approximately 80% of patients feel better and experience fewer or less severe infections after surgery. Minor bleeding is common after sinus surgery. Excessive bleeding and re-operation are rare. Only 1-2% of patients experience severe complications that may include meningitis, tearing problems, double vision or blindness. Sinus headaches are very annoying. In their mildest forms, they respond to over-the-counter decongestants. In their more severe forms, they require aggressive treatment with prescription medications. Headaches can be frustrating to treat because they can be difficult to distinguish from migraines or other forms of headaches. The severity of the headache does not always correlate to the severity of the underlying sinus disease. There are alot of patients with severe sinus disease with minimal headaches, while others experience headaches with simple weather/barometric changes. When medically treating sinus headaches, I am treating the swelling and congestion in the sinuses that is often the cause of the headaches. Treatment may include nasal saline flushes, nasal steroid sprays, decongestants, and/or antihistamines. Many people find these medications adequate to control their occasional sinus headache. Since the list of causes for headaches is so long, allergy testing (and allergy shots if indicated) or a CT scan of the sinuses could be beneficial to determine if there are anatomical reasons for your headaches. Balloon Sinuplasty has made a large difference for patients with sinus headaches. Previously, we had to weigh the risks of surgery vs. the possible benefits of surgery. With Balloon Sinuplasty, the treatment options for patients have greatly improved. There are several different types of sinus surgery, and after a complete evaluation, we will create a surgical plan tailored to meet your individual needs. You will need to be off work/school for one week. Two weeks free of heavy lifting, exercise/physical activity, and no flying for 3 weeks post surgery. Sleeping elevated for the first 2-3 nights helps with drainage and swelling. The day after surgery, the patient will start flushing to get all the debris from surgery out of the nose. Many patients have described recovery to feel like a bad head cold with facial pressure, congestion and possible headaches. A pain medication will be prescribed after surgery, but many patients do well with just Tylenol after the first couple of days. We will schedule a follow up visit at one week after surgery, and then again at two weeks post surgery. Even though you may be "feeling" better a week after surgery, complete healing can take up to a month. Patients with diabetes or patients who smoke may experience a longer recovery time. Patients having sinus surgery for other reasons, such as severe headaches or the removal of polyps. The success rate varies, but research still shows the majority of patients benefit from having sinus surgery. Minor bleeding is common after sinus surgery. Excessive bleeding that requires hospitalization and re-operation are rare. While severe complications are very rare (1-2%), they may include meningitis, tearing problems, double vision and blindness. Improvement does not occur immediately. You are training your immune system which takes time. Any immunotherapy is a 3-5 year commitment. Your first allergy season after starting immunotherapy may only be slightly less than normal, but with each season you will notice the benefits. Your symptoms are better controlled, and less medication is needed. Allergy shots (Immunotherapy injections) are administered to allergic patients who have symptoms that affect their quality of life. As an experienced San Antonio allergy doctor, Dr. Gilliam knows that some allergic patients may not need allergy shots for treatment of their symptoms. If however, medications and/or environmental changes are not sufficient to minimize symptoms, allergy shots may then be the most effective option available. In persons who require multiple medications to control their symptoms, allergy shots may actually be a cost saving option when considering the pharmacy "co-pays" and the out-of-pocket expense of "over-the-counter" drugs such as "Claritin" and "Allegra." Immunotherapy is usually very effective for the treatment of nasal allergies and approximately 95% of patients will improve on shots. Immunotherapy "turns off" the allergic reaction to pollens, molds, dust mites, and animal dander over time. This is accomplished by the frequent administration of the material to which the patient is allergic. During the "build-up" phase of immunotherapy (the initial 6 to 12 months on the allergy injections), there is a gradual decrease in sensitivity to allergens. Unfortunately, up to 50% of patients with true "Allergies" (Allergic Rhinitis) also suffer from "Non-Allergic" rhinitis. Allergy shots do not treat the symptoms of "Non-Allergic" Rhinitis caused by sensitivity to environmental irritants. Nasal symptoms triggered by weather changes, tobacco smoke, perfumes, strong odors, exercise, diesel fumes, spicy food, dust, dirt and other irritants, may require medical treatment while on allergy shots. Immunotherapy is the only real treatment for the underlying cause of allergies. Antihistamines and other medications try to stop the reaction after it has already started. Immunotherapy (allergy shots or allergy drops) try to prevent the reaction from ever starting. Immunotherapy shots are usually administered in the upper arm. During the "build-up" phase, these shots are given once a week using a schedule of progressive dosage increases until the "maintenance" dose is reached. Once you are on the maintenance dose, the time between injections can be increased, attempting to make the shot administration once or twice per month. Maintaining your shots at the proper time interval is very important, however, missing shots for a short vacation or because of some other problem is usually acceptable. Missing shots may require temporary dosage reductions. Allergy shots are generally continued for a period of three to five years; after which your doctor may consider discontinuing the allergy shots for an observation period. Symptom control along with repeat testing, helps determine when immunotherapy can be discontinued. Immunotherapy injections may be associated with various types of side effects. Side effects are usually more common in the most severely allergic patients and in those with asthma. The most common side effect is swelling or inflammation at the injection site. These "local" reactions almost always improve over time. Allergy shots may occasionally be associated with more serious generalized "systemic" reaction(s). Symptoms or signs of these reactions may consist of hives, body tissue swelling distant from the injection site, increasing asthma symptoms, abdominal pain, diarrhea, dizziness and even loss of consciousness. Life-threatening reactions are extremely rare. However, it is very important to carry your Epipen at all times if receiving immunotherapy (allergy shots or drops). It is also vital to follow all doctor/ clinic instructions and let them know of any and all reactions. 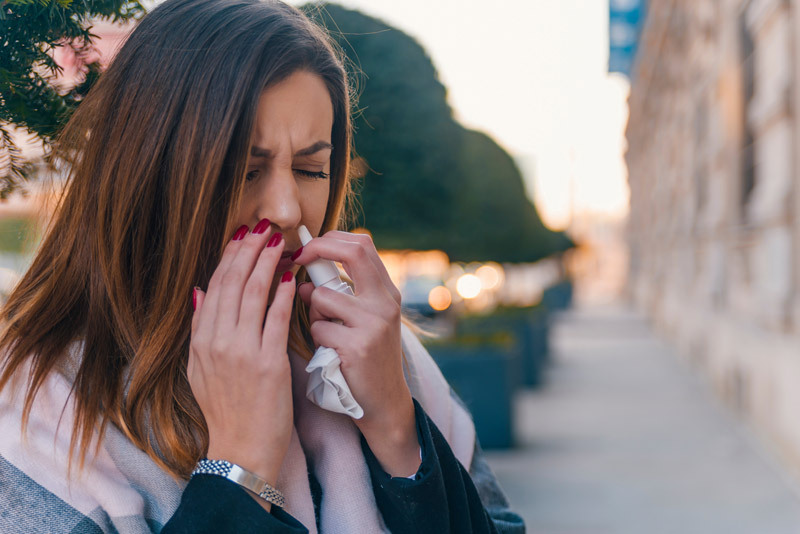 Our office is prepared to treat any serious reaction that our patients from San Antonio or Stone Oak may develop, but if the allergic symptoms do not respond quickly to our treatment, it may be necessary to transport you to the nearest Emergency room for further monitoring.